The Fantasy League Classic without any doubt is the original fantasy football game. It is one of the most popular and perhaps watched and even followed by millions of football lovers. They bet quite heavily on it, and there are quite a few reasons for the same. It has one of the cleanest and simplest scoring rules. Further, when you are part of the Fantasy Football Classic team you also have the facility to go in for private league option. However, this would require 5 to 16 managers. Further, it is possible to have premier league competition with 20 strangers, and this applies to all registered teams. 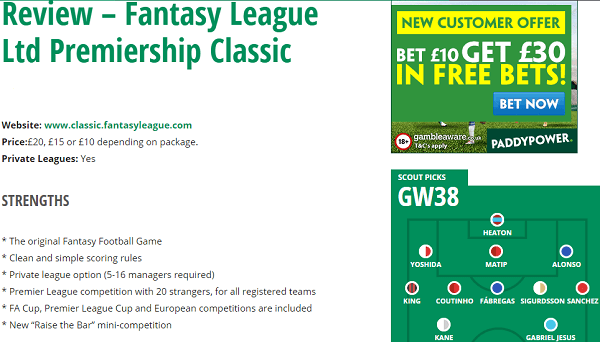 When you are a part of the Fantasy Football League Classic competition, you will be able to be a part of Premier League competition with 20 strangers, and this is applicable for all registered team. Further, you will be a part of Premier League Cup, FA Cup, and all the European competitions will be a part of it. Hence, at the end of the day, there is hardly any doubt, which it is one of the best fantasy football leagues, that we have come across in recent history. Finally, they have something known as Raise the Bar Mini Competition, which without any doubt is the icing on the cake. However, it would not be right to mention, that it does not have some weak sides to it. It is relatively expensive when compared to other many other such fantasy leagues that are now being made available across the spectrum. It is relatively expensive when compared to many others. Secondly, because of unlimited substitutes, there is a possibility of creating a divide in the private league between causal managers and a hands-on manager. Hence, this could have a negative impact as far as Classic fantasy football team names are concerned. Further, unlike many other fantasy league games, there is no possibility of going in for player auction. Finally, when you are playing with strangers, it is quite likely, that you will not have much of fun. Now that we have had a relatively close look at the pros, cons and basic features of this fantasy leagues classic is concerned. It would be pertinent to mention here that the classic version is well and truly an online version and it resembled the tried and proven Fantasy League Ltd in more ways than one. Yes, once can be a part of this league using the fantasy league classic app. As managers, you will be able to register 16 players from the available player list, and you have a set budget of £75 million. Once you are on the move, the teams have 25 transfers, but the same are capped at 5 per month. You are entitled to unlimited substitutions and access to the Supersub System. Is certainly allows you to swap players out for individual fixtures in advance. It would be interesting to have a look at the scoring system, and when you see the Yahoo fantasy football classic view as an example, you can be sure that you have the simplest plan around. Players are entitled to get 3 points for a goal and 2 for an assist. Further, goalkeepers and assists can get the point each for appearing in the pitch for 45 minutes. Two additional points could come the way if there is a clean sheet provided they can play at least for 75 minutes. For each goal conceded 1 point is lost. What Is the League All About? There are many reasons to believe, that the Fantasy Classic League is popular and no fuss option. It does not require the need for electing a chairperson for administering the league rules. Further, managers do not have to meet up or conduct the auction of players online. All that is required is that you must register and then select the team and join the league set up by you and your friends. You can then go ahead with the fantasy league classic players list. It is very much the same as various other Fantasy Football Games that are held out there. 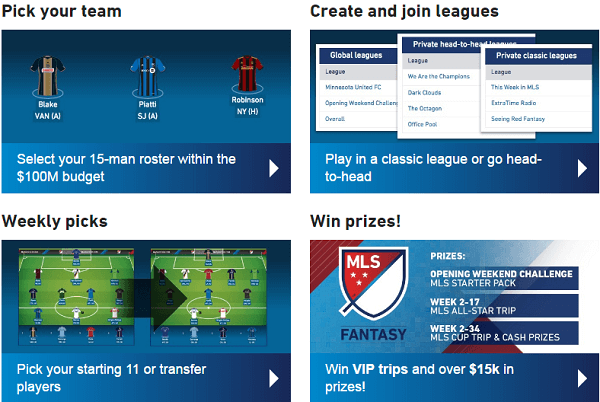 However, since it is a Fantasy League game you could be in for many more features once you pay the registration fee. It would be pertinent to mention here that there are three different packages available. Each of them offers and allows entrance to the overall seasonal competition and that too against all registered players. All the three will also offer the opportunity to set up what is referred to as Friends and Enemies League with an FA Cup competition to boot. In this competition, your team will be able to score points from real life FA Cup games which effectively mean that you will have a mini league for those teams as far as your private league is concerned. You also have the chance of being a part of the gold and silver packages which are priced at £15 and 20 respectively. You will be eligible for silver and gold national championship. It also will open avenues to increased prize money. Additionally, there is a host of other extra facilities such as weekly team reports and live update of points. The standard package of £10 is likely to be the obvious choice for many because of lower fees. But because the gold and silver are also quite affordable many would be willing to go about it. If one looks at the classic game is something which tries and goes through a middle ground the pro game and the kind of facilities offered by others such as Mail Online. Hence, there is no doubt, which it is a great option for those who would like to get into fantasy football gaming without running the risk of burning the pocket.